You. Me. Ride This Crazy Train - Adventures and Observations on The GO: This Crazy Train's Presto Chronicles, Chapter 34: What has improved with the new website? They should have just left it. At least you could view an entire month at one time. What I would like to see is my card number attached to each monthly statement and loyalty summary. That used to show up on the old printouts. Now I don't have backup proof for the CRA. @Bicky: I hope they hear and fix the "no card number on the statement" issue or they will have MANY irate customers come March who are facing the possibility of being denied their 15% credit (which, considering I spend at least $3500/year, is not negligible) by the picky CRA! 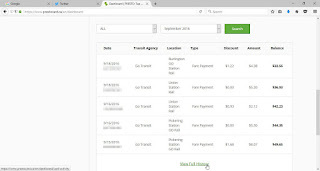 @Nora1968 - let's not forget the "no name on the annual transit usage report" issue. There's a spot for the name but GO Transit and Presto say the number is enough along with a photocopy of your card. Tell that to the CRA auditors who say "No, it's not good enough." Round and round we go. I've also heard that the federal government is reviewing all tax credits and looking to chop some. This transit credit might disappear altogether. I find I have to make many more clicks to get where I want to be than I did before. That's not an improvement. Sure, I can understand that not every update is going to have clear UI improvements visible to the user but it shouldn't be a step back from what we had either. I lost my registered Presto card several years ago. Not knowing that I had to report it before getting a new card in order to have the balance moved over, I got a new card right away (I had to travel, you know). Anyways, that old card is STILL on my account (with a $50 balance), but I can't do anything with it. 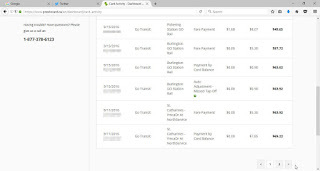 I can't delete the card from my account, I can's move the money to my current card, nothing! Why can I manage that kind of information on any other platform (Amazon, PayPal, even my Timmy's card), but Presto forces me to keep the long lost card on my account. I always have to double check that I don't accidentally top up its balance at the end of the month. Folks this is not Go but presto. Go has nothing whatsoever to do with that web site. @Ed: It all falls under the Metrolinx umbrella. Right hand doesn't know/care what the left hand is doing? At some point, an agency has to have the buck stop with them. Bicky, Go and presto are two separate companies that do not tell each other what to do. Presto made the changes and MX had no say in it. Go does not make a dime from any transaction on that website nor do they have any access to their web server. 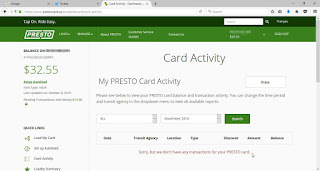 Presto developers did all the work. 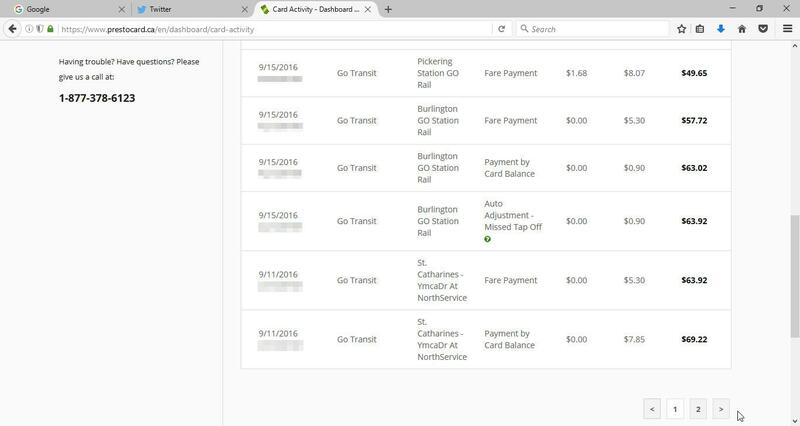 Go can ask for changes but presto is under no obligation to accommodate those requests. Just because they are cooperating doesn't mean MX has any appreciable authority. 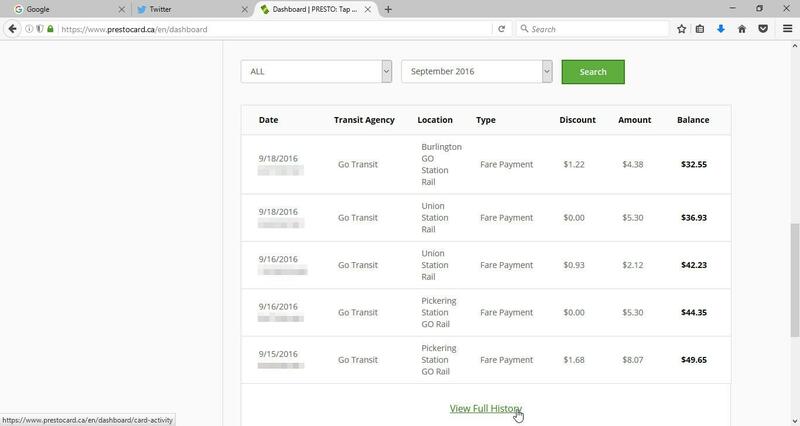 The TTC, Oakville, Burlington and Hamilton transit systems also use the presto system but have zero say in their business operations. They know what each other is doing but that's it. Each business is separate. @Ed, that may be so, but when one calls for help, GO says "Talk to Presto." Call Presto, they say "Talk to GO." No help at all. This is why customers hate both. Which does nothing to address my point. Again. MX does not have any influence at all with their website unless it affects GO operations. Updates usually don't. I personally think there's far too much white space and not enough information on any screen. IMO several could be combined to make one easy to read screen. I think I liked the old format much better.